Habib University students Alina Halai and Amna Shoaib write a blog about the event the HU student club ‘Habib Feminist Collective’ organized, so that students, faculty and staff at HU could listen and learn from the experiences of women in journalism. 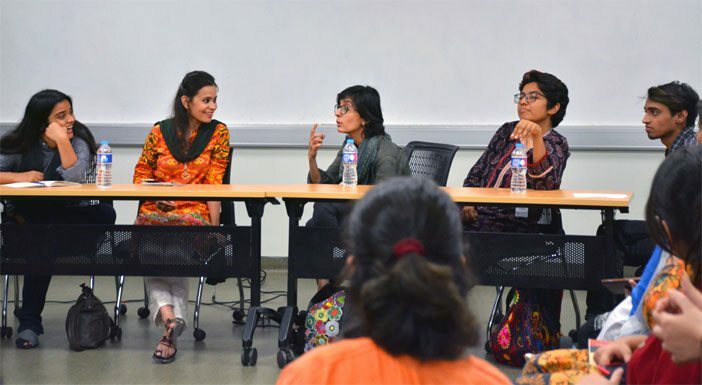 Habib University’s feminist club, H-FEM hosted a panel discussion on Women in Journalism. Journalists invited were Kiran Khan, a crime and politics field reporter for Dunya News. She has taken on projects in a city clouded with chaos, where she would sometimes be the only woman reporting live; Haya Fatima Iqbal, documentary film-maker, journalist and story-teller, Haya is also a professor at HU, teaching students to explore issues which tend to be neglected, as she does; and Rahma Mian, who worked in print and broadcast journalism for 7 years, reporting editing and producing quality work for a number of platforms and she continues to advocate for our right to information. The club’s outreach activists, HU students Amna Shoaib and Asad Aly played the role of moderators. The purpose of this event was to converse about women in public spaces, specifically in Pakistan. There are various conversations which are already taking place regarding this matter, however it is important to acknowledge that women are not existing in public spaces on their own terms. They interact with public spaces for a purpose and rarely without company. Female journalists have been navigating the misogynistic cesspool that are public spaces in Pakistan for a long period of time making the above mentioned women the best choice for panellists to shed light on navigating through these spaces. These women enter a space which is not their own. They have to work out how to exercise their bodies and how to appropriately preach their feminist ideals. Haya stated that body language is extremely important stating “the way women conduct themselves will dictate the way they are treated.” It may be something as simple as setting up the camera but the non-verbal communication taking place is beyond simplicity. There are many issues that take place in the field which go beyond the presence of lecherous men. Kiran pointed out that often a woman has to appropriate their behaviour according to her environment even if goes against her feminist ideals. For instance, there are not many public bathrooms in Karachi, which means journalists often have to go up to 15 hours without even a sip of water leading to other biological problems. Journalists tend to be hyper aware about the way their dupatta is placed and whether their clothes are appropriate as harassment is a painful and inevitable reality. Haya said, “your generation needs to learn how to navigate a man’s world before implementing your views on them.” As there is a comparatively small number of women journalists, it is futile to ask for drastic changes in behaviour. Therefore, for journalists especially, it is important to first make sure there are enough women present collectively to begin the battle to be treated equally and ask for rights not given to us. As many HU students take up projects and jobs which require them to be out in the field, it is necessary for them to learn about the realities they will be dealing with, no matter how harsh. As a mentor and faculty member, Haya Fatima takes the lead in many initiatives when it comes to helping students, especially women, navigate in public spaces in Pakistan.